Forget Tax Day, let's make it Relax Day! Discounts and freebies for April 15! 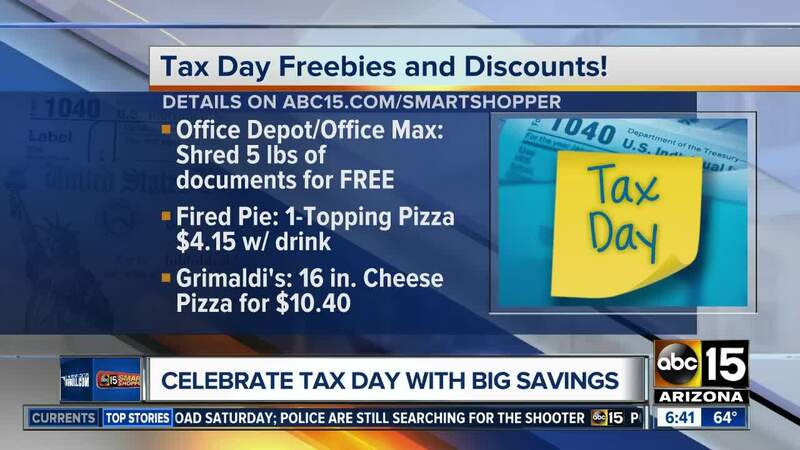 Monday, April 15, is Tax Day, and lots of businesses are offering you a financial break! BurgerFi: $4.15 BurgerFi Cheeseburgers on Monday, April 15 through the BurgerFi app only . 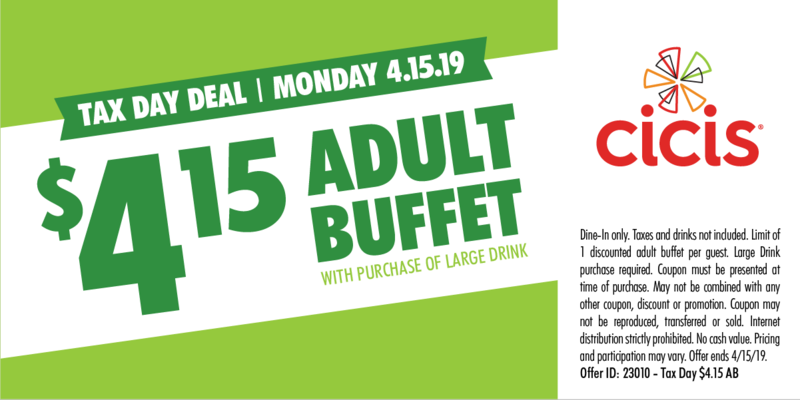 Cicis: Adult buffets are $4.15 Tax Day when you buy a large drink and present this coupon. Kona Ice: Tax Day is Kona Ice's National "Chill Out Day." On Monday, get a free cup of tropical shaved ice. Find participating hours and locations here. Office Depot/OfficeMax: Through April 27, shred up to five pounds of documents for free. Use this coupon. Potbelly: Buy one salad, get a salad free, or buy a sandwich, get a sandwich free, OR buy a "Pick Your Pair" (combination), get one free. This is only available through the app. Schlotzsky's: Get a free small original sandwich when you buy chips and a medium drink on Tax Day. This deal is available at all locations and no coupon is needed. Grimaldi’s Pizzeria: on Monday, April 15th, spend $10.40 for a 16-inch Traditional Cheese Pizza. This deal is valid at the restaurants only, not available through 3rd party delivery. Fired Pie: On Monday, April 15th score any one-topping pizza for just $4.15 with purchase of a drink. This deal is valid at the restaurant only, not available through 3rd party delivery. Sauce Pizza and Wine: Treat Tax Day whining with some wine! The restaurant will offer glasses of wine and beer for just $4.15 for beverages that are originally $7 and under. Most beer and wine options on the menu are eligible, but some are not that are over $7. This offer is available for dine-in only and is not valid with any other discounts or offers. Limit one offer per guest, per visit. No cash value. What other deals do you see out there? Email us so we can add it to our list!